– We are meeting with the Lt. Governor; is there something you would like to SAY? – The video you will want to share! When you look around, are you seeing what I am seeing? More of our children are experiencing sadness and despair. They are engaging in harmful behaviors like cutting and drug abuse. Children are being prescribed anti-anxiety and anti-depressants at alarming rates. Youth are being incarcerated younger and for increasingly more minor offenses. And more kids are taking their lives and having their lives taken from them. Is it possible that if we do not learn joy in childhood, we will not know happiness in adulthood? The work we do is more than changing policies and priorities, it’s about joy. It’s about ensuring that we honor a person’s brief childhood. It’s about play, creativity and imagination. It’s about cooperation and respecting each other. It’s about creating a world that values people and works for the common good, not the Common Core. Uniting4Kids recently received our non-profit status. Our coalition is growing here in Colorado and nationally, if you would like to get involved, please sign up on the volunteer link. It’s simple really. We work for kids and youth. We work for the simple purpose of creating more connections, more meaning and more joy! This week our Coalition is meeting with the Colorado Lt. Governor, Joe Garcia. If you have something you would like to say to the Governor, please send your letter to: Lynn Roberts at lynn@thebrowntrout.net. We will hand carry your letter to the Governor’s office. Join Opt Out parents from across the state at the May 23rdRockies Game at 7:10 pm against the San Francisco Giants. HUGE FUN and HUGE opportunity to make some NOISE and hit National and local news! ‪ Tickets are only $5 (Rockpile) and come with ‪#‎optout wristband. If you had a rockpile ticket for the rained out April 26 game, keep your original ticket and show up on Saturday, May 23rd at 7:10pm. This is the rescheduled “rainout” game and you don’t need a different ticket. If you still need to buy rockpile tickets, you can go to the Rockies website : http://colorado.rockies.mlb.com or the many online sites (ie: www.VividSeats.com) to buy in advance. …there were $12 rockpile seats available today. In 2012 after a contentious school board election, I felt frustrated, almost hopeless, about the future of my sons’ educations. I decided I needed educate myself and take action to alleviate my feeling of despair. I went to my first opt out meeting in January 2013 and decided immediately this was something I needed to pursue. I needed to DO something to feel empowered. At that meeting I met Carla and we immediately hit it off. Together we were able to share our concerns and outrage as well as our fears about taking the bold step of opting out. At one point, we were discussing how to keep our kids from being tested on make-up testing days. We were brainstorming ideas on how to label or identify our children (carry a note around, pin a note to their shirts, etc.) What began as a joke, turned into a campaign. 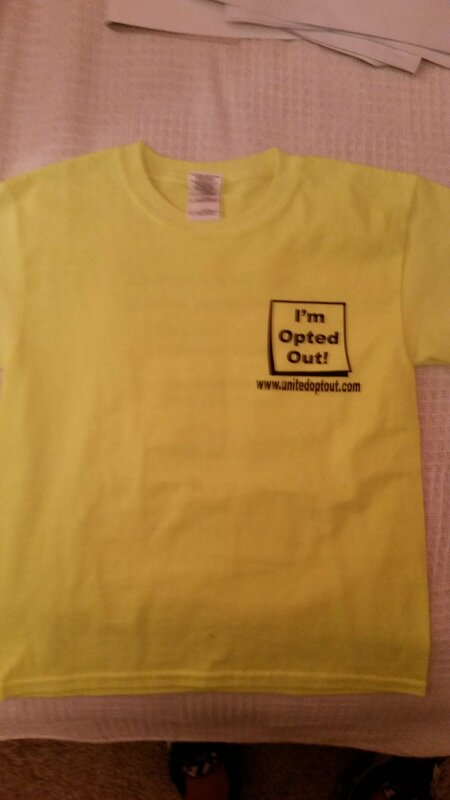 We decided to dress our kids in flourescent t-shirts with a clear message for why we were opting out. We worked together on the design and ordered enough for the children in our area that we knew were opting out. What happened next was unexpected. Carla’s daughter wore the shirt to another meeting where someone snapped a picture of it and posted it on Facebook. Overnight, the picture had tons of “likes” and dozens of shares. People in New Jersey even began requesting them! We started to get enough requests that we decided it would make sense to make more shirts and sell them as a fundraiser for the non-profit UnitedOptOut.com. To date, we have sold nearly 200 t-shirts in 23 states and 85 cities. Proceeds are used to pay for expenses like supplies, brochures, and even lodging for out of town education speakers. We have been able to fund more opt out informational meetings and publish materials to help inform more parents about their rights to opt out.